On October 21 in Syria, U.S.-supported Islamist rebels invaded and occupied the ancient Christian settlement of Sadad for over a week, until ousted by the Syrian army. What took place that week was “the largest massacre of Christians in Syria,” in the words of Orthodox Archbishop Alnemeh. 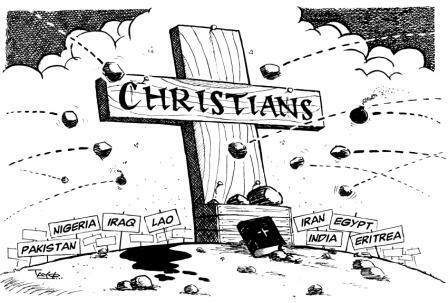 Among other things, 45 Christians–including women and children–were killed, several were tortured to death; mass graves were discovered; all of Sadad’s 14 churches, some ancient, were ransacked and destroyed; the bodies of six people from one family, ranging from ages 16 to 90, were found at the bottom of a well (an increasingly common fate for “subhuman” Christians). The jihadis also made a graphic video (with English subtitles) of those whom they massacred, while shouting Islam’s victory-cry, “Allahu Akbar!” [“Allah is Greater!,” meaning “than anything”]. Another video, made after Sadad was liberated, shows more graphicatrocities. The day before rebels invaded Sadad, on Sunday, October 20, the Church of the Virgin Mary in Warraq, near Cairo, Egypt, was attacked during a wedding ceremony. The attack left four dead and nearly two dozen wounded. According to a report issued by a forensic team, two of those murdered were young girls, each named Mary: 12-year-old Mary Nabil Fahmy, who was shot five times in the chest, and 8-year-old Mary Ashraf Masih (“Masih” meaning “Christ”), who was shot in the back. These massacres in Syria and Egypt received scant attention and even less condemnation from Western media and governments. Instead, people such as Mohamed Elibiary, an Obama administration Homeland Security adviser, condemned Copts who raise awareness of anti-Christian violence in Egypt as promoting “Islamophobic” bigotry. Bangladesh: “A local government official in central Bangladesh has halted the construction of a church, forced Christians to worship at a mosque and threatened them with eviction from their village unless they renounce their faith,” said Morning Star News. “The Tangail Evangelical Holiness Church in Bilbathuagani village… was created Sept. 8 by a group of about 25 Christians who had been meeting secretly for three years. However, local council chairman Rafiqul Islam Faruk joined around 200 demonstrators Sept. 13 to protest against the start of the building of the church. The following day, the Christians were summoned to his office. More than 1,000 Muslims waited outside, following an announcement at all local mosques to gather at the chairman’s office.” There, they were ordered to embrace Islam or suffer the consequences. Said one of the Christians: “Their threats chilled me to the bone. That is why I pretended to accept Islam, but faith in Christ is the wellspring of my life.” Another said: “The chairman is clipping the wings of our faith. I do not know how long we can grin and bear it. We want religious freedom. We want to practice our religion freely.” Since Sept. 14, under the chairman’s orders, eight Christians agreed to return to Islam. Apparently, the chairman and his associates had already beaten some of these Christians three years ago for accepting Christianity. Kazakhstan: After Bakhytzhan Kashkumbayev, a 67-year-old pastor, was released from five months’ detention, based on charges his family and others insist are spurious. After being reunited with his family, he was arrested again within minutes, now accused of “propaganda of terrorism or extremism, or public calls to commit an act of terrorism or extremism, as well as the distribution of material of the content indicated.” His son, Askar, told Forum 18 News Service, “These new accusations are complete rubbish. They’re trying to turn my father into a terrorist.” Grace Church in Astana, where Kashkumbayev served, has, according to the report, long been subject to state harassment, including accusations of being involved in espionage, fraud, money laundering, distributing extremist texts and using hallucinogenic communion drinks. Kenya: Charles Matole, pastor of the Redeemed Gospel Church, was found shot dead while still sitting with a Bible on his lap: “We found him with blood oozing from the head,” said a choir member. The pastor had been receiving threatening phone text messages. Similarly, Pastor Ebrahim Kidata of the East African Pentecostal Churches was found murdered, strangled to death, in a patch of bushes. After a Muslim man slaughtered a Christian–in broad daylight and in front of police–accusing him of being “an infidel who blasphemed against Muhammad” (see September report), a group of armed men broke into the dead man’s family home, threatening to kill its members if they did not withdraw their police complaint against the murderer, and convert to Islam. Fr. Arshad Gill, a priest in Karachi, told Asia News “about this ‘sad story’ in which the victim is ‘an innocent man’ and his family is told to convert to Islam or die. For him, the case epitomizes the situation of Pakistan’s minorities, forced to live ‘in conditions of profound insecurity’ in which events such as this one tend to exacerbate the situation…. Found in Article 295, B and C of the Pakistan Penal Code, the [blasphemy] ‘law’ punishes with death or life in prison anyone who desecrates the Qur’an or defames the name of the Prophet Muhammad.” Those few political activists who have tried to repeal the law–such as Punjab Governor Salman Taseer, a Muslim, and Minorities Minister Shahbaz Bhatti, a Christian–have been murdered. Rana Tanveer, a chief reporter for The Express Tribune, received a one-page letter in Urdu threatening him to stop covering the plight of minorities. He was further accused of being an “apostate” for allegedly sympathizing with Christians and Ahmadis, instead of with their Sunni Muslim oppressors. He was also threatened with death, “from where you cannot even imagine.” Tanveer, a Muslim, insists that all his reports are objective and based on facts. Iran: After being arrested in a house church December 2012 and charged with consuming alcohol in violation of the Islamic theocracy’s laws, four Christians were sentenced to 80 lashes for drinking communion wine. “The sentences handed down to these members of the Church of Iran effectively criminalize the Christian sacrament of sharing in the Lord’s Supper and constitute an unacceptable infringement on the right to practice faith freely and peaceably,” a human rights activist said.